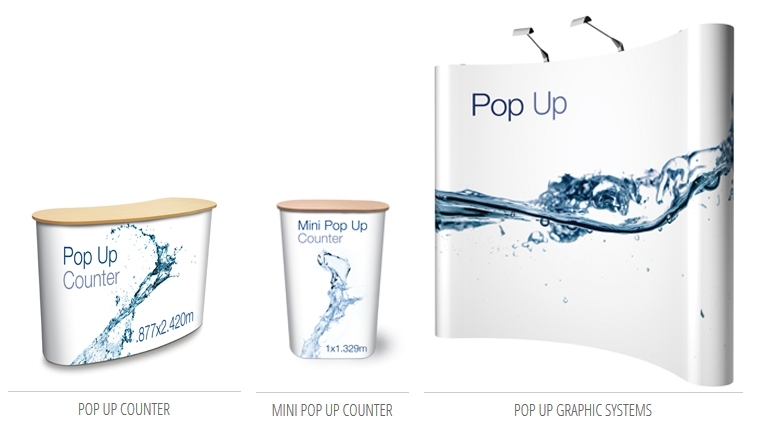 Pop up curved wall graphic display stands are the perfect lightweight exhibition solution. They are very easy to assemble, are highly portable and they represent great value for money. Quick to dismantle, each display can be packed away in just a few minutes into the wheeled carry case which converts into a counter! Why choose a curved wall solution? Curved display walls are designed to maximise the visual field of view which means your display messages will be visible from multiple angles. Get noticed from every direction! From Counters to Podiums and so much more! What’s more, 200m2’s curved wall pop up displays are complemented by a full range of accessories. From pop up counters which double up as a carry case to shelving and halogen lights, set up your next exhibition stand in minutes. All our portable units are quality assured and carry a 5-year guarantee. Invest in confidence, safe in the knowledge that your new exhibition equipment will endure even the busiest of exhibition programmes.